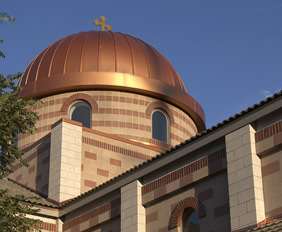 Saints Constantine and Helen Orthodox Church began in 1974 when Metropolitan Vladimir of blessed memory made contact with Orthodox faithful in Colorado Springs. At the time, liturgical services were periodically held at the Air Force Academy by Orthodox chaplains. Encouraged by the response, Metropolitan Vladimir asked Father John Schreiber, then assistant priest at Saint Innocent Church in Tarzana, CA, to consider starting a mission in our city. 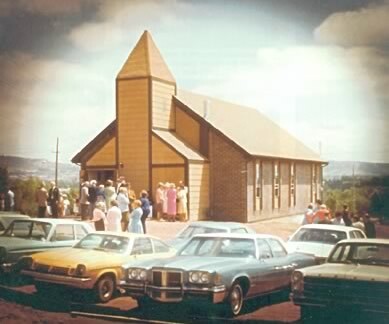 While on vacation in August of 1974 Father John stopped in Colorado Springs. One month later he moved here and began work with the mission. The first “official” service took place on September 8, 1974—the Feast of the Nativity of the Theotokos, and the beginning of the liturgical year… truly a fitting and appropriate beginning for a new Orthodox community. In those early days, Metropolitan Vladimir dedicated the community in memory of the heavenly patrons Saints Constantine and Helen. Divine Liturgy was celebrated every Sunday morning in various donated facilities, while Vespers and Feast Day services were held in Father John’s apartment. In August of 1975, a little less than one year after the start of the mission, the Church was incorporated and an acre of land was purchased on North Chestnut Street.